This strategy is powered by data liquidity and has, over a relatively brief period of time, proved immensely transformative for visual entertainment production, delivery, and consumption. So why is there not a similar approach employed for the decidedly more important purpose of transforming our lagging healthcare system? Why don’t we use the enormous cache of extant health data to better deliver the services that wide demographic ranges of patients need, and simultaneously evolve those services into an ever more effective and efficient healthcare system via learnings from that data? The answer is that, at present, we can’t. Unlike digital natives and data-driven tech companies such as Netflix, the health sector currently suffers from a morbid case of information inertia and until this problem is treated, there will be no systemic transformation. Even with the rise of the internet and the global shift toward digital transformation — the popular perception that data is available and accessible everywhere — data is not liquid in the healthcare system world. Sure, it’s being collected, but holistic or comprehensive individual health information data doesn’t “live” anywhere and there is no uniform means to share it. The data is not centralized nor is it accessible in the way you can access movies on Netflix or get updated information at the push of a button when you want it. This is the reason patients have to fill out the same basic forms and answer the same rudimentary questions at every point of interaction in a health care process, often even within the confines of a single healthcare organization. There are multiple digital connections and multiple systems, but data is still siloed. 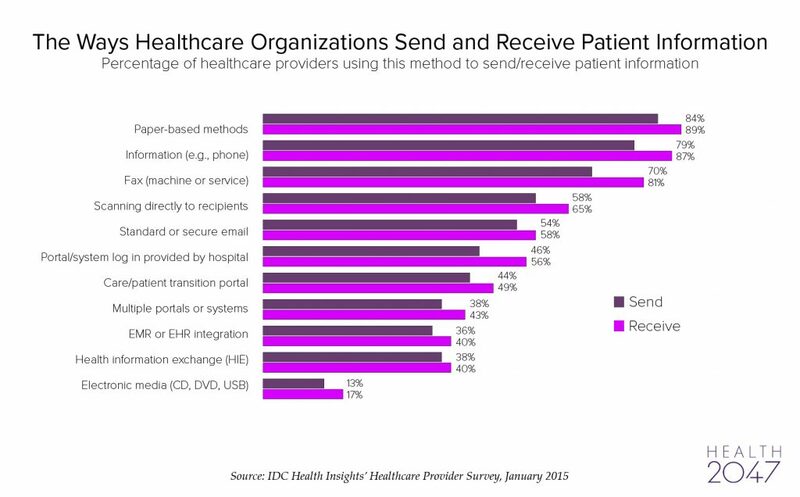 We have various EMRs, EHRs and HIEs collecting myriad records of interactions, but not all the data. Why? The easy answer is that it is done to ensure patient privacy and security. However, the truth is that we do it out of fear. The healthcare sector’s digital systems and computing servers are often running monolithic database technology conceived back in the 1960s and not designed for the internet connected world we live in today, and thus cannot be secured for the level of access and use we need. To get around this, we hoard health data and treat it as a commodity that people can’t understand. Even as we digitize healthcare, we throw up firewalls, security, or multiple interfaces around and between systems, and then we raise the banner of HIPAA (which actually was designed to increase liquidity, and yet we use it as a barrier). Don’t get me wrong, there are very real security and privacy issues involved in patient data, but that is not what is stopping the flow of information. The reason we lack data liquidity in health care is very simple: misinterpretation. We view IT security risks and measures such as HIPAA as proof that health data is both dangerous and valuable, and mistakenly interpret that to mean that it must be locked down at all costs — which entirely misses the point. The whole purpose of collecting health data is to solve patient issues and make them better or preemptively prevent health problems from ever occurring. Yet we’ve spent billions of dollars creating silos that don’t serve this core purpose and don’t work. And now we’re spending billions of dollars on integration for those silos — but we still haven’t addressed the central issue of setting the data in motion. This shows that we have decided to view data as too important to share. The truth is that data has absolutely no inherent value until it is shared. Security and patient privacy are still crucial, but the mission must be to set the data free so that we can actually improve the health of those patients we’re trying to protect. If we endeavor to correct the misinterpretation of data’s purpose, then we can begin to enable that Netflix model: properly treat healthcare’s information inertia problem, free up the ability to exchange information, and let data liquidity drive transformative health sector modernization. There are implementation complexities that will have to be addressed throughout this process, a subject I plan to explore further in future posts, but adjusting our perspective is a solid first step.